One of the biggest appeals of Richmond is its artistic side. As the home of Virginia Commonwealth University, a college touted among the most prominent arts schools in the country, a booming arts district is inescapable. And within that booming arts district sits historic Jackson Ward, one of the most creatively-condensed neighborhoods in the city. It even hosts our monthly First Friday Art Walk, a gallery showcase that takes place on the, you guessed it, first Friday of every month. It’s lively and imaginative, with art galleries opening their doors to the public, live music, and buskers all over the street. But outside of this monthly outbreak, the daily art scene is still vibrant in Jackson Ward. There are two historic theaters, an improv comedy theater, a record store, multiple art galleries, and Gallery5, a concert venue-slash-art gallery-slash-bar. 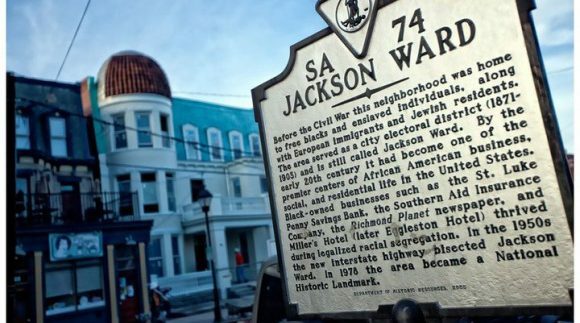 Jackson Ward was dubbed a National Historic Landmark District in 1978, and is inundated with historic buildings including churches, monuments, and the aforementioned theaters. The area’s architecture reflects its historic reputation as well, with strings of vintage yet sturdy townhouses, regular houses, and apartments. They’ve all got that historic charm and appeal, with many stories within their walls. And you can’t miss the neighborhood’s recent restaurant surge, with numerous popular dining spots and two speakeasies. Which I guess in 2017 are just “bars.” There’s also this really precious ice cream shop that was dreamed up by a man who died of cancer, then executed by his 80-year-old parents. This isn’t really relevant to the neighborhood, I just like reminding people about this story. There’s very little that Richmond loves more than history, art, and food, making historic Jackson Ward the inevitable apple of our city’s eye.